On Thursday, August 9th, 2012 we held the second segment of Venus Meets GAIA with the Holy Kumaras. We were introduced to Lord Sa Ananda representing the Flame of Wisdom. This is the decree that he imparted to us for the class. It enfolds within me and I feel my composition changing deeply in all ways. Each of these elements mold the deepness of my wisdom. I now feel the Divine Wisdom that I AM. Which is truly God’s Truth. As I AM that I AM that I AM. We are constantly reminded that the Venetian way of accessing the Rays of God is through our totality so the four body system is assisted but the main focal point is always the Light Body of all bodies being ONE. In our first class we fully intuited our Will of God through our I AM Presence. It is not our physical reality but the essence we are all trying to fully incorporate within us. Lord Sa Ananda is the flame holder of the Yellow Ray representing the Wisdom of God. Lord Sa Ananda represents the Wisdom of God through deep intensified studies. He has been in this role as one of the Holy Kumaras for the last 200 years of our lifetime. He spent several lifetimes as a warrior in Atlantis, Egypt, and other star systems. He is a reformed Kumara in the sense that he fully was not trained for this position until Sanat Kumara took him under his command in Lemuria. He is a convert so-to-speak as he understands what the warrior attitude represents and reformed himself through the process. This took many years being on Venus and fully not sure this is the post that he felt was his destiny. That has changed so he brings us the ability to be strong in our studies and access our I AM Presence as it will be our guide into our future world. He saw this occur in Venus and now is very ready to assist us in accessing our own knowledges through our I AM Presence. This is a very new post for Lord Sa Ananda to hold and we are honored to fully understand his Soul’s Essence to impart to us as we are learned to move from the Warriorship into Torch Bearer pathway. I Am a speaker of many worlds. I have traveled the Universes in search of meaning when I could find none in my heart. I learned with the great warriors of your history and other timelines. I fought the great wars on Earth, beyond Earth, and in the Galactic missions. I was part of the Intergalactic Federal of Light as my warriorship was considered a blessing in the realm of worlds beyond worlds. It was during this time that I met up with Sanat Kumara. He saw something in me that I did not know I possessed and totally changed my entire experience of life. It took me many lessons to acquire what I have presently and I will share with you the ability to move through your own warriorship attitudes to find the truth within you through the essence of God. I look back upon my life during those times and I know if served my highest purpose but then, it came to a time that I must understand what I have lived into a new concept of reality. God is within me and does God want me to fight the wars. Sometimes I was on the wrong side so please know that is part of the process of our Divinity. I see both the Light and the Dark and have walked among many high beings of Light. I took these knowledges and put them into my practice on Venus. I studied hard and learned the concepts I had acquired in my pathway would serve a greater purpose ~ to learn how to live in complete cooperation of my Wisdom while access my Godliness Within. It is with great pleasure that I am able to show this part of myself to each of you. I believe that my essence will help and guide each of you into a different aspect than you may not realize. It is with this gift of sight that I have to see beyond where others have not gone. It is our time to fully be in Oneness together upon Terra Christa, the New Earth. Let us guide each other through this process of awareness within. This is a 6-month program presented by the Holy Kumaras and can be utilized in an individual’s spare time through audio downloads. My personal experience in being the channel for this energy is that it will totally put you where you have wanted to be and is the highest vibrational work we can do presently. Details provided on Walking Terra Christa. When there is a major event of energetic changes, I am usually apprised of the energies immediately through Spirit or my inner senses. This was not the case for the 8:8 Lion’s Gate Frequencies. I was surprised that my physical reality was not aware of the magnificence of this day upon this year in 2012; but alas, I bring to you in these moments my inner guidance as it came to me this morning. I awoke with a sense of feeling different; like I needed to adjust something within me. I had the impression that I needed to start my day earlier than usual. My partner was still asleep so I opted to get going on the energies. I opened my computer and read some information on the energies of this day but was not totally moved by these occurrences until I decided to go into our new medicine wheel in our backyard. As I sat calling upon all the directions, animals, beings of light and fully commanding the higher forces to be within me, I experienced a vision of Isis and Osiris asking to join me. They both are very prevalent in my pathway with my partner, Mike, and I whole heartedly agreed to allow them into my space. I felt Isis in her feminine power urging me to do the same. As I was flowing with these energies, I realized that the tasks that we have put upon us in the last couple of weeks were overflowing within my physical essence. I started to feel more relaxed and allowing the essence of my own Divine Feminine to fully integrate through me. It was a beautiful moment and then arrived the esoteric energies of a beautiful Lion in all her glory. In a moment I opened my eyes, and there stood my own cat named “Isis” starring at me with her beautiful stature and realized that the Lion had fully come within Isis to share a physical moment. I felt the essence of the Lion fully within the medicine wheel and allowed it to balance within me through all of the directions representing the Mental, Emotional, Physical, and Spiritual bodies within. We then shared a deep connection. At this time, I sat and wrote lists of tasks that need to be accomplished within the next week. I felt more focused and not overwhelmed by what needed to be done but very centered with everything. I gave my thanks and left the wheel with Isis, my cat running off to play with the elementals of the land. Now is the opportune time to share the energies of the Sirian Council of Light that they want to impart through me. The Sirians have become very physical in our world in Mt. Shasta as of last December. 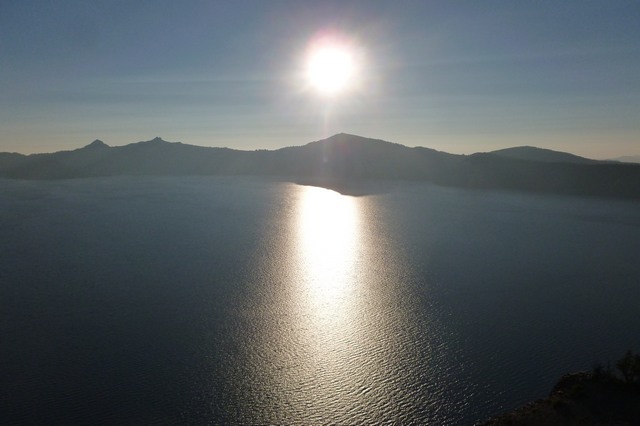 They shared with us light packet frequencies dancing upon the waters one day at Siskiyou Lake which reflected in the sun and then fully came through our Being. We were at a time that additional protection was needed for us in a Galactic sense and they walked into this role. It is my deep pleasure to share with you the knowledges they want to impart on this day. It is our Divine Pleasure to speak through Meleriessee unto each of you. We ask of you to take a moment of reflection; breathe deeply and allow your essence to be totally open to our transmission of light. This will be a deep reflection within you to allow the frequencies to change your composition of awareness. On this day of August 8th in this year of 2012 there is a new Gateway that is opening up into the frequencies of Divine Completeness. The Earth has been in separation for many years of existence, so much more than all of us can count together. We, of the Sirians, understand this transition. That is why we acknowledge you from the Star System of Sirius B as we communicate to you from the 7th dimensional frequency of Light. Sirius A is still on the lower frequencies as what your planet is experiencing at this time. (Please note, we understand that many assume we exist within the 6th dimensional level but that is changing for us also just as you are moving from the 4th into the 5th dimensional realities.) That is why this opportune time is aligning each of us together. Just as your Earth has the heritage of the Egyptian culture, we also have the same alignment. It is another reason why we are so desire to extend our hand of service to each of you. We understand the process that each of you is undergoing at this time. We are in full comprehension of the desire for more while not understand how to fully acquire the pathway to do so. Lion’s Gateway is a portal of Light that is being ignited to allow each individual upon your planet to move from a lower density vibration into the next octave of energy to help align cosmic souls to fully complete a cycle of rebirth. This portal is open every year, but today is an opportune time due to the light frequencies upon the Universal Structure and Galaxy at this time. Each of the planets has been aligning themselves to be the gatekeepers for Earth in order to allow the ascension process to continue. It is a vibrancy of light to change every organism and light frequency within and on the planet to assist in this doorway. What does this mean for you individually? Well, whatever you have been dealing with in an imbalanced state can be put into full alignment by being the portal of Light yourself. It is about the stillness of the moment when you look into the dark sky and see the luminescent star shining down upon you. You are One with the star in that moment and nothing else matters. This doorway will illuminate your Being in a way that you have not experienced in any manner, shape or form. The alignment of the planets and stars are at your disposal in this moment from the dawn through the sunset and beyond. There is not one specific timeframe that is being centered upon but just the stillness of the day. It is yours to allow your reflection of your essence to be fully within your Being. This, in turn, will assist the planet for others to feel it for themselves. You, as the Lightworkers, Torchbearers, and guides of the Light upon Earth have a grave job to fill. You do this every day but today it is not with the telephone, nor the computer, it is in personal connection. 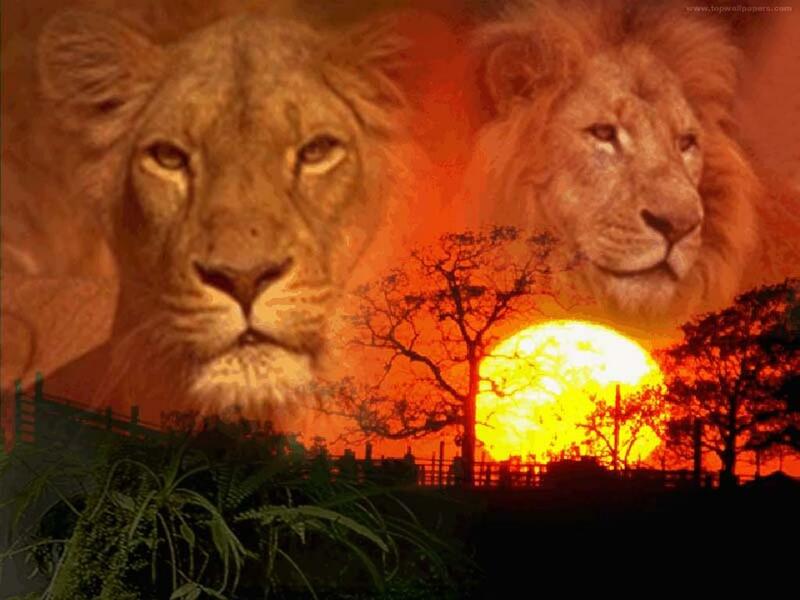 It must start first with nature allowing the Lion to show you the way unto the higher realms. 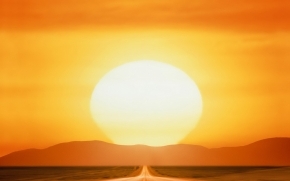 The ability to fully actualize the 10th dimensional reality of the Great Central Sun is being aligned at this time. Allowing yourself to be the guidepost for the Earth you shall receive this light. All elements will be in perfect alignment; you do not have to do anything to make it happen but just Being One with the Earth. It will take silence, a moment of reflection, and the luminescent light shining down upon you. You will then be a beacon of light for others to feel. This is a new creation of alignment that is being felt on this day. It does not matter where you connect, when you do so, but please make it important in your life in this day. The connection that you will have will be with all star systems that have walked before you, extending out their hand to help you to accept your Divine Blueprint as a Star Being, an Angel, and Light Frequency unto this Earth. We, of the Sirians, extend our hands to you along with many others; the Lord of the Great Bear Star System who is our father in heaven houses many stars and planets that help to awaken others unto themselves. We walk with everyone but our task at hand presently is to be the messenger. Our message is keep striving for the unknown, for the glory, and the light within you. You are not alone; we are with you together in this quest for light of Gaia. It is also no mistake that all of this is occurring at this time. Leo is the leader with a wonderful heart to share with others. The Harmonic Convergence has always occurred August 16th through 18th for the last 25 years. Allow the Gateway of the Lion to be your guide as you now step more fully into your power, allowing your gifts to be shared to others, but most of all yourself. The frequency of Light that is being imbued at this time could not have happened without the Harmonic Convergence of many years ago which each of us in the Star Nations have helped to create to the Earth. Each of you, on Earth, allowed it to be fully imbued within your Beings. You walked with great pride each year to allow these frequencies to change your thoughts, feelings, and physical composition. Walk with the Lion through the Gateway of what you have created, accomplished, and now the real work begins as each of us will be fully aligned with your new-born self upon this Earth. It is our time of fully communication; we are your Star Brothers and Sisters and are proud to say “This reunion of our souls will create the New Earth”. We are now physical beings working in unison towards the ONE. As an added extra note to Meleriessee: we thank her for being the channel that she has been and is. This information was kept from her until the time was right for her to understand the totality of the information and the pathway. This is our beginning with her and her partner in their physical world. Thank you, Mel and Mike, for being our guide to your Hearts of the many. I want to take a moment and give my deep gratitude for the Sirians walking into our world in the past year. Without them we would never had been able to achieve what we have and they gave us extra tools for protective measures from others that did not want us to create this beautiful pathway. Their words of love and gratitude for Mike and me have brought tears to my eyes. I thank you deeply for being in our world and look forward to our physical existence with each other. 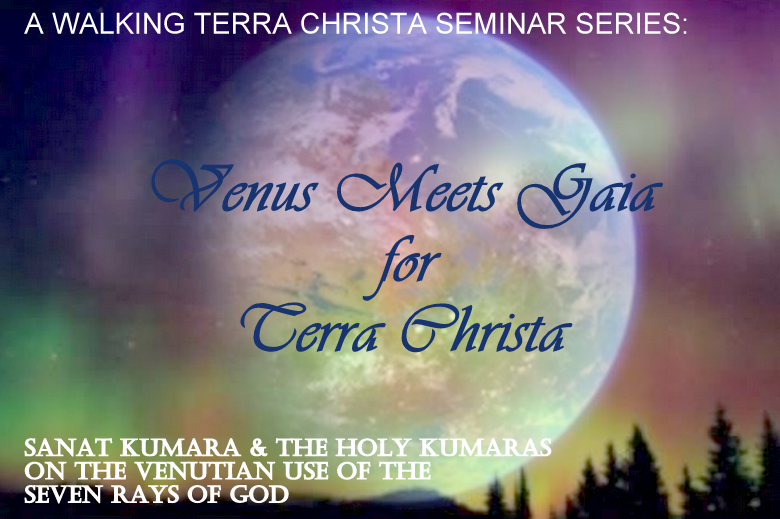 In the program series of Venus Meets Gaia for Terra Christa we are introduced to each of the Holy Kumaras that overlight the Venetian Rays of God. Our first introduction was with Lord Sanatka who represents the Ray of Will of God in the color of Deep Blue. We are working with the Venetian Rays of God are on the seventh dimensional frequency and are accessed within the totality of our Light Body not within a specific chakra as the teachings of the Planetary and Universal Rays of God. The frequencies are quite different because they represent the highest aspect and no lower qualities are ever included in the teachings as in the Rays of God taught through Dr. Joshua David Stone, specific qualities and aspects are directly related to the chakras and the Four-Body system. We are asked to look at the four-body system as the Body of Light and there is no differential qualities that relate to one or the other. This allows each individual to fully access the energies from the Soul Star into each of the chakras and grounding the frequencies within the Earth Star. Lord Sanatka brings forth a composition of energy that represents God’s Will but also very compassionate and loving which I feel is representative of the Holy Kumaras and the Venetian qualities that each of us loves so very much. The visualization that each individual experiences is basically the same but a very personal experience as both Sanat and Sanatka share aspects within each individual in how to focus on their particular situation. We prefer to express to each individual the ability to move mountains through the experience of the Will of God. In Earth’s history much has been forgotten about the totality of one’s ability to remember all aspects within their Being. The Will of God is the beginning stage of allowing the remembrance of the Divine Will of God being in each individual’s composition to fully create their experiences as guided by the I AM Presence. In your history this is something that needed to be re-created so that the experiences of life can be refreshed but yet accessed through memory cycles within the brain’s function. Since Earth has lived in a third dimensional reality for eons of time and now housed within the fourth dimension it was thought that the remembrance would be a hindrance. That is no longer the case as these energies are available to all of those that seek their own highest vibrational levels within a body. We, on Venus, are excited to share our knowledges through this channel and teacher as it will be a rebirth of energies for each individual. Should you desire to work with us, please know that it is time for each of us to blend our focus of light Together. My background is very extensive. I have worked with the Holy Kumaras of what you would call many centuries and my chosen pathway has been here on Venus. I also walked the lands of Lemuria and I fully help others to access the beautiful moments on those lands. I chose to come directly to Venus to regenerate my soul’s essence after much pain and sadness of loosing my comrades in arms. I was a warrior at that time and during my time of healing here on Venus, I learned that I needed to fully acquire a new pathway that did not include that pathway of Light although I thought it was the correct one. Looking back, I laugh to myself, and see what my transition truly brought forth to me. I needed to be a warrior and when it was time to fully allow the Light to flow within me, that healed me greatly in all ways, spiritually, physcially, mentally, and emotionally. It took me quite a few lifetimes to get that context within my mental attitude. I have worked with Sanat Kumara since my arrival here on Venus and he has shown me many elements of change that allowed me to understand truly what the Will of God represented for me personally. It created such a transformative process within my Being that when I was asked to go into training as one of the Holy Kumaras I was both excited and fearful that I could handle the job. The Ray of Will is strong and the downfall is not allow your mental mind to take control. I know this from personal experience and fully allowed my essence to flow from the mental into the emotional to fully accept my spiritual destiny. This Ray of Deep Blue will allow your Mental Mind to fully surrender into the union of your Divine but only if you allow it to happen and THAT IS YOUR WILL. I am here to assist through this process and I am so excited about this program that Meleriessee and Mike are sharing with others. I look forward to communicating with you personally and professionally. If you are interested in participating in this program, please see our website page, Sanat Kumara & The Holy Kumaras. We also hold two weekly high vibrational meditation tele-calls and monthly Mastery classes. We are at the midpoint of 2012 which is our year to really accelerate our beings into a new paradigm of light. We, at Walking Terra Christa, have been honored to have many Masters come to us with special programs they would like to share with many individuals. Sanat Kumara is presenting to share with us our remembrances of our lives on Venus in and out of the body. His presence is being better known to each of us on Earth than it has been for quite awhile. We are excited about the new program he wants to share through us, and I, for one cannot tell you how this program is going to work. I am trusting my intuition as we are going into deeper levels than we ever have accomplished previously, and I am the channel that is bringing forth this information. Just to give a bit of background information on Sanat Kumara and my personal relationship with him. Sanat started the Brotherhood and Sisterhood of White Light in Lemuria when it was a time of separation of the Feminine and Masculine Divine. Lemuria being such a loving place of community invited many souls that were hurting from other planetary levels as a safe haven. Unfortunately, this came with elements of darkness and the Feminine aspects were being destroyed. Sanat asked the Goddesses to go into hiding to safe keep their treasures and created the Brotherhood of White Light as a protective measure. All teachings would go through the organization and no others would be allowed to enter that did not adhere to the strict regulations. It was created to fully honor the Feminine Divine teachings of Egyptian, Roman, Hindu, Chinese, Japanese and all sects representing Earth Mother, nurturing, and complete honorability of life. He is the father of the Spiritual Hierarchy and continues to be so to this day. My personal interaction with Sanat was in San Francisco as I was walking through China Town after attending Dr. Joshua David Stone’s Wesak Festival in Mt. Shasta, California. He appeared as an older Chinese man who lost his change. I bent over to pick it up and hand it to him. He held my hand tightly and looked into my eyes, “THANK YOU FOR HELPING ME.” It was not until I walked away that I realized who he was by the look and his essence. I stopped dead in my tracks and fell to my knees in tears. I realized the work that I was starting to create in 1999 was making an impact on the Universe. It was a moment of pure reflection of who I was becoming and being. So it is with great pride that he has come to Mike Hayden and myself to share this wonderful teaching program to assist individuals in blending their energies into a 7th dimensional light body to access the teachings of the Holy Kumaras. Most of us have spent a great deal of time on Venus in our inner plane activities and in between lifetimes. Some of us have even lived on Venus in the physical realm. This program is helping each of us to remember our full essence as it is deeply needed in the structure of the New Earth. We are going to be moving into a new way of living so it is time to remember the old ways which were absolutely beautiful. This program “Venus Meets Gaia for Terra Christa” is a seven month program which includes a class discussion with each of the Holy Kumaras and then a private session within each three-week period. Each individual is being introduced personally to each of the Holy Kumaras they represent the Venetian Rays of God. It is quite different than the Earth’s understanding of the Rays of God due to the 7th dimensional structure being One Unified Body. So they are assisting us in fully accessing the totality that we are through the Essence of God which is our I AM Presence. If you would like to learn more about this program, please see http://walkingterrachrista.com/series-sanat-kumara/. I will be sharing the decrees that we are writing for each of the classes. The first one represents our introductory class to the Holy Kumaras. Thank you, Sanat Kumara and all of the Holy Kumaras for believing in Me. So Mote It Be in the Light of the All. This program can be started at your leisure as it includes MP3 downloads although many individuals enjoy the live class. Please let us know if you have an interest in participating. Effective at 8:55 AM Pacific on August 2nd we will fully be in the full moon cycle of Aquarius. The energies that are occurring presently with this cycle represent our ability to nurture and love ourselves to be able to create. It is also a cycle where we come out of our womb of safety and share ourselves with others within our community and network of souls. At this juncture of time within 2012, we are experiencing the ability to see how far we have evolved in order to share our wisdom in the outside world. It is a time to no longer be within as our gifts are accelerating, but to show how much we have fully integrated in our lives. It is a time to stand up to what we believe, remove the old elements that kept us in secret as they no longer serve our purpose. It is a very powerful time indeed. In order to walk this pathway of showing our Will and Power we first need to fully look inside of our Hearts and look at the reflection that is our strength. We no longer can walk in this world just by living in a physical body. It is our time to allow our Higher Self to be our guiding Light. For some this may be a scary thing to incorporate as we have walked with our mental faculties since our arrival on Earth. It is our safety net to tap into our mind and logically find a reason to do a task, create a new way of doing something, or speaking to another person about the changes we feel. It is time for each of us to accept our full essence that we are Divine Beings of Light, have gift(s) to share with humanity, and learn to accept our humble beginnings. Those humble beginnings have allowed us to fully create our pathways presently which probably include challenges of many levels. In order for us to accept our pathway of mastery it is essential that we learn to create through the processes of being a human being. We chose to arrive at this time within our physical existence. At times, it feels like we just want to give up what we have worked so deeply to create. This, my friends, is called the initiation process. We come into the physical reality with the sense that our Higher Self is our guide and that we can accomplish anything we choose. What we do not realize is that we need to learn how to access these elements that is part of our Divine Heritage to embody. Some are lucky to have this uncanny effect within their lives that this is their truth. Most of us have to learn through trial and error. It is part of the process as when we learn to create from the lowest points in our life, we see we are a supreme being that creates their reality. Then when we are at the higher points, it becomes easier for us to manifest our desires. But this is where the pitfall can occur. If one does not continually to remember to use their Higher Self as their guide and falls back into the mental chit-chat, then we can go back to the struggle mode. That is when we create the safety net to not step out of the norm. This is what humanity has been experiencing for eons of time but 2012 gives us a whole different perspective. At this full moon in August, we are given a rare opportunity to just step out of the safety zone and into the new awareness that each of our higher self’s have created for us. All we have to do is accept that we are a Divine Being by breathing deeply into the highest aspect of ourselves. If you meditate daily, then you are doing this already. It is just a matter of accepting it in a moment-by-moment basis. It is YOU; you just have not realized it yet. 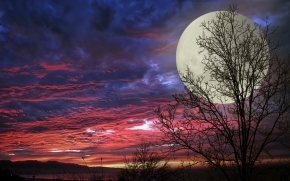 This full moon is a wonderful blessing to each of us. As we connect with Grandmother Moon, we learn how to fully accept the highest qualities of ourselves and remove the lowest parts that do not fit into our reality. As we do, so we learn that we are Divine Beings given the ability to REMEMBER our uniqueness and share it with the world. Now is the time to full accept what you already know inside and share it with another. Start with Grandmother Moon first, tell her who you are, how you want to be more creative in your pathway, and you shall see that she will Light the Way for you. It is a miraculous time to fully accept our highest essence within our bodies as we are being assisted by Gaia, Mother Earth, the Star Nations and Beings, the Inner Earth Beings, and all aspects of ourselves that are now ready to be born into Who You Are Now. If you would like to listen to a great meditation of this Full Moon, please check out Walking Terra Christa.com for our ceremony on August 1st. August 16th through 18th is the 25th anniversary of the first Harmonic Convergence in 1987. It was a very exciting time as individuals were gathering for an event that promised to open up energy doorways unto this Earth. Here we are 25 years later now celebrating the last of this event. 2012 has stood up to its promises of energetic exchanges, eclipses, Solstice events, and the most powerful Wesak we ever experienced on this planet. We are at a juncture of time as I write this blog on the 1st of August. The energies upon the planet are at the highest than they have ever been and each of us as the lightworkers and awakened ones are truly embodying these frequencies to help Gaia and all her inhabitants. “Harmonic Convergence was defined by Jose Arguelles as: “the point at which the counter-spin of history finally comes to a momentary halt, and the still imperceptible spin of post-history commences.” It was the fulfillment of the prophecy of Quetzalcoatl, known as the Thirteen Heavens and Nine Hells. The prophecy stated that following the ninth hell, humanity would know and experience an unprecedented New Age of Peace. The Hell cycle ended on August 16, 1987; the Harmonic Convergence began on August 17. Thus began the projected twenty-five year culmination of the 5,125 year Great Cycle of History, as well as the 26,000-year cycle both slated to end in 2012” (http://www.thewildrose.net/harmonic_convergence.html). This is a time of great celebration as it marks 25 years of allowing each of us as Lightworkers to fully integrate the frequencies of Light that have been marked by planetary alignments, our Star brothers and sisters assisting us which has not been an easy task for any of us no matter when you awakened unto the higher realms. As one that was truly aware from the beginning, I fully walked in many pathways that assisted me to transform many elements of lower energies that previously did not allow me to walk into Mastery. Each of these pathways which included Native American Shamanism, learning healing modalities, herbs, vitamins, healthy way of eating without diary and heavy foods, Inner Child Recovery work, deep meditations, being a medium/messenger for Spirit in my personal life, and learning what ascension was and how to incorporate it within my life and for others have brought me into the Being I am fully incorporating at this time. The energy was very dense in the late 80’s and 90’s so it was a deep challenge of keep trudging forward even though we were in a world where many individuals did not understand. All of that has changed drastically. Many more individuals have awakened, are learning more about themselves than they ever imagined, and many have very special gifts to share. We are growing in great leaps and bounds to achieve the ability to walk as integrated Beings of Light within the physical existence. It is a very powerful time indeed. Much as changed drastically during this time. We now talk about Oneness and are learning how to incorporate it within our lives. Individuals are sharing themselves from their Hearts while helping others. We are in LOVE CONSCIOUSNESS and learning to express ourselves much deeper than ever before. I remember as a child that this is what I wished for so deeply when I felt I was misunderstood because of the spiritual gifts I brought with me. So I held them away in secret for a very long time. It has taken me just as much time to allow them to shine brightly through great inner work learning that the beginning stages where only the surface and underneath was a depth-ness that at one time would be revealed within me. It was a long journey to search and find the answers but the depth was truly not in the searching but the full realization of who I AM. This is what the Harmonic Convergence means to me. I have celebrated the energies every year since and saw the great changes that I made through the process. Those of us that allowed the energies to enfold within truly helped to make the pathway wider for those that would follow. This is very exciting to see how it is all enfolding for planetary awareness and moving into the New Earth essence. It is a long time coming and I am very excited to have been a major player to see the movement of awareness fully being activated within so many individuals. So this Harmonic Convergence is very special. It means we have come to a point in time that we are finally accepting the acceleration on this planet at a much deeper level than we ever thought possible. It also comes at a time when we are at a crucial stage of the energetic level within this planet and the forces of duality are going to shift dramatically. During this time we will be experiencing a NEW MOON which will be in Leo which marks the ability to bring forth our leadership roles. 2012 promised to be the year of the Golden Era. It is coming into fruition as I write these words. At this time, the planet is being infused with so much Light that it is necessary for each of us to integrate it and send it to Gaia to assist her in her ascension process. We are not out of the woods yet but the Harmonic Convergence marks a time in our evolution to fully accept what we have accomplished with great pride within our Hearts. I am very excited to experience the end of this amazing cycle in 2012. My partner, Mike Hayden, and I are hosting a special retreat to fully embrace these energies in Mt. Shasta. We will spend three days with individuals sharing our teachings of Lord Adama and the New Earth Consciousness while helping them to accelerate and transform their physical awareness within the four body system. We are sharing how to create a 7th dimensional home and environment while experiencing the most beautiful sites in the Universe. We also are being guided by Lord Adama to host a special teaching on Sunday evening for individuals that want to be considered as a Telosian/New Earth Ambassador. 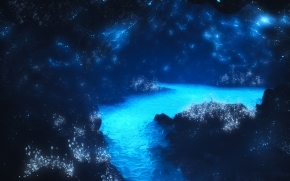 This will be a very responsible position in which each person will be assigned to a New Earth Golden City to work with the overlighting beings and help the land masses in the specific area. We are really excited to be part of this special project with the Inner Earth Beings of Light. For more information, please see http://walkingterrachrista.com/retreat. We are now accelerating into a whole new phase on Earth as we become Terra Christa. I want to thank each of you for walking into your own awareness as each of you is assisting tremendously in creating the New Earth. Wishing you an amazing experience for the last Harmonic Convergence energies.